The Staff from Discount School Supply Shares Ideas with Early Childhood Professionals, Preschool Educators and Parents! My name is Shirley Daniel and I have worked for Discount School Supply for over 10 years. I currently work in the Inside Sales Department. In my position as Account Manager I work closely with my customers, getting a better understanding of their centers, programs, preschools and schools - and their unique needs - while working to supply them with the best quality products at the best pricing possible. While this is my job, this close one-on-one exchange results in something much more - the development of great relationships with my customers. Having formerly worked in the ECE world, we can share stories of our experiences and I can certainly relate to their wonderful, creative, demanding and very rewarding daily environment. The end result of this exchange is an enjoyable experience for both of us. My customers know that they can trust me to respond quickly and efficiently to their inquiries and that I will always do my best to fulfill their requests and handle any issues that arise. My background in Merchandising for the Discount School Supply catalog – and hands-on experience with many of our products – enables me to better provide them with insight into some of our products’ features and benefits. This relationship with my Discount School Supply customers also encourages them to communicate their experiences with our products and they love to pass along suggestions for new product development. We love to send those great ideas along to our buyers and Product Development group. We are listening – so please keep those ideas coming! which includes 12 pairs of rhythm sticks with a CD plus our own instructional guide containing a variety of activities. With all of these great music sets, there is a need for a storage solution and we have a product that is custom-made for that. 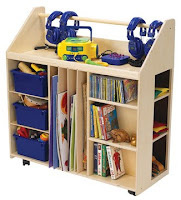 Our Discount School Supply exclusive Angeles® One Stop Music Media Cart – with its shelves, bins, adjustable vertical storage, and 3 side cubbies – is perfect for storing all of those multi-piece activity sets, rhythm band instruments, videos, DVDs, CDs, big books, plus there is also space on top for CD players and a handy rod for storing headphones – and it’s caster-mounted for easy mobility in the classroom. It’s great to know that Discount School Supply is adding music and movement (plus storage solutions) to your active, creative classrooms. Discount School Supply (DSS) is a designer, manufacturer and distributor of products for children from infancy to age eight. Now in its 26th year, DSS places primary importance on its relationship with its valued customers, who are educators, caregivers and the families of young children. We offer products through Discount School Supply catalogs and at DiscountSchoolSupply.com. We’re proud of the unique products we have developed for young children which are available only from Discount School Supply, including a wide assortment of arts & crafts materials under the Colorations® brand. Our service levels are outstanding: your satisfaction is guaranteed by our 110% Low Price Guarantee and by our freight-free return. If you place your order by 2 pm in your time zone, your in-stock items will ship that day and be in your home or classroom within two days. You won’t be invoiced until your order is complete – one order, one invoice. Here at Circle Time, our staff members highlight their favorite products to share with you. You’ll discover how or why some products were developed and about creative ways to use products that we learn about from our terrific customers. We hope you will become part of the conversation and join us for Circle Time!